Kadima Knesset Member Avi Dichter is leaving Israel's largest opposition party to join the government as a minister. He has resigned from the Knesset and is set to be appointed home front defense minister on Thursday. 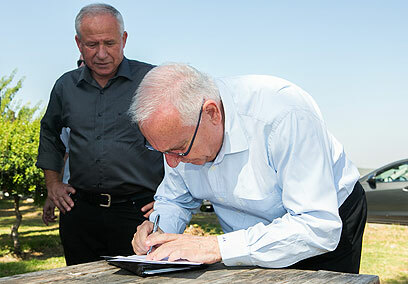 Dichter was offered the post at a meeting with Defense Minister Ehud Barak on Monday and later met with Prime Minister Benjamin Netanyahu to discuss the transition. Several possible candidates were considered for the position of home front defense minister in the wake of Matan Vilnai's departure. Vilnai is leaving the post to serve as Israel's ambassador in Beijing. Dichter has already sent Knesset Speaker Reuven Rivlin his letter of resignation and is scheduled to be appointed minister on Thursday. He will join the government as an independent and will not be affiliated with any political party. Earlier, sources close to Dichter stressed he is not taking part in any attempt to split Kadima. He explained his decision on Facebook, "After much deliberation which I withheld from no one, I have decided to accept the prime minister and defense minister's proposal to be appointed home front defense minister. Personal and partisan considerations were edged aside and I have chosen to serve the state the best way I can." He concluded his post by saying "country first, me second." Replacing him in Kadima will be Ahmed Dabbah, a leading party activist and ally of Chairman Shaul Mofaz. On Tuesday, Netanyahu told Dichter he has an important task at hand – "contribute to state security." At a welcoming cerement for new olim, the prime minister said, "The state under my leadership has done more to protect the home front than any other administration and Minister Avi Dichter will continue to do so in his new capacity." Will Dichter endorse Iran strike? A close associate of Minister Barak, Dichter's positions on the Iranian issue are not entirely clear and he has yet to publically endorse an Israeli strike on the Islamic Republic's nuclear facilities. Recently, it was reported that he opposed the attack on the Syrian reactor, which foreign press attributes to Israel. Last month, Dichter addressed the possibility of a military operation in Iran and said, "No doubt the current US administration has raised the bar in handling the Iranian issue but the question is will they take it a step further?" Asked what would happen if the world fails to act, he replied, "I don't think it's strictly an Israeli problem. Israel must build attack capabilities for when the time comes. We must beware of a situation where it becomes apparent the threat is such that there is no choice but to attack. There are many things to do until that time." See all talkbacks "Dichter quits Kadima to join government "